It’s been a while since my last post and I have a lot to report. I finally quit my job! He chocked it up to cultural differences, whatever the case I don’t have to work anymore. Now I have to stop spending money to make up for the lack of a second income. Next order of business, my brother arrived in Korea the other day. Alex will be teaching at a school in Suwon, a larger city 30 min. north of Songtan. I went to see him on Thursday night and check to see how he was doing. Jet lag and hunger mixed with an overwhelming amount of information being thrown at him obviously increased his exhaustion level but he’ll get into the swing of things in no time. He’ll head down to Songtan Saturday or Sunday to visit me and see my town. So since I no longer have a job and have some free time on my hands I decided to go on a day trip with some girlfriends from base today. 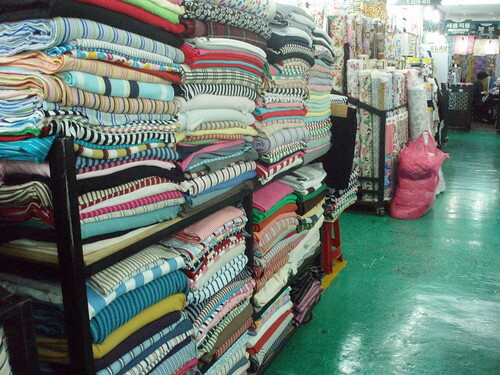 We headed to Dongdaemun Fabric Market in Seoul. 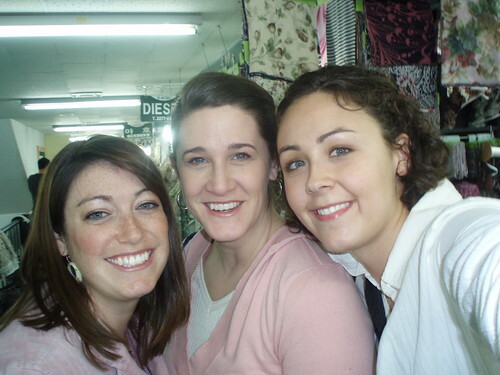 Me, Stephanie and Tami outside the fabric market. 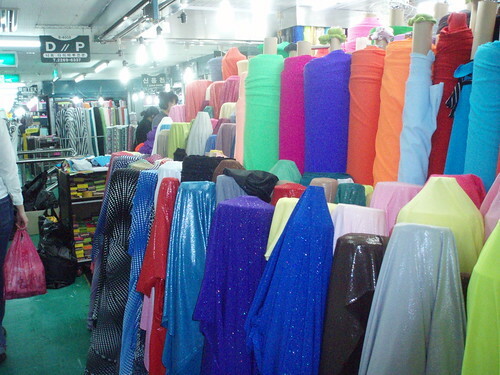 This is the enormous fabric and trimmings market in Seoul. 9 floors spanning an entire avenue block filled with fabric, yarn, trimmings, buttons, ribbons, upholstery, and beads. Every piece of clothing or jewelry you wear that says “Made in Korea” originates from this place. Most of the vendors did not seem happy selling 1 – 2 yards of fabric to American women who were obviously not there for wholesale purchases. 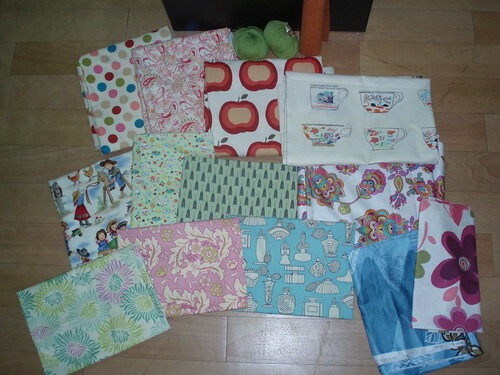 We didn’t care and came home with yards and yards of amazingly cheap fabrics. I got all this fabric (17 yards), some yarn and felt for about $65. I have no idea what I’m going to make with it all. After walking in circles in what seemed like a never ending warehouse of fabric stalls, we headed down the street for some lunch at a Donkkas restaurant. I introduced Tami and Stephanie to Japanese Donkkas or breaded pork cutlet with a tangy Asian barbeque sauce and a side of rice and kimchi. 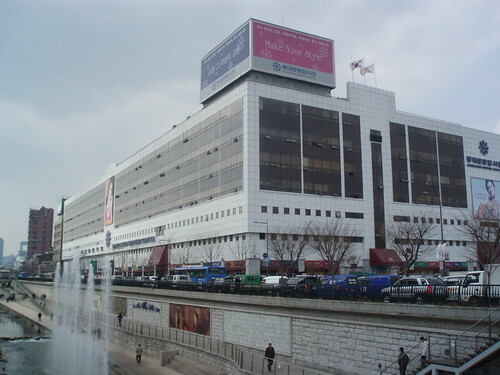 We got to Dongdaemun about 10:30 AM and by 2:30 we were ready to call it a day. 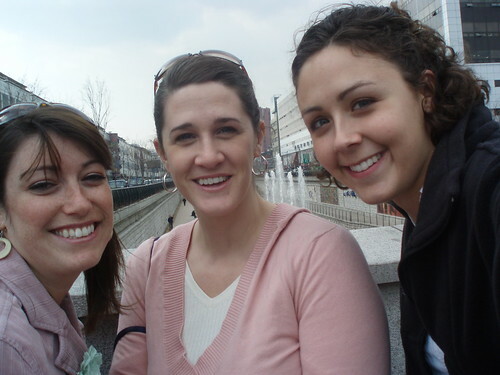 We headed back via the subway and had to transfer trains a few times. We were chatting away so much that twice we were left sitting all alone on a train wondering why that particular stop was so popular when a Korean would have to somehow translate to us that this was the last stop. What is normally an hour long trip took us over 2 hours but we had a blast and are heading to Itaewon on Wednesday for another day trip.